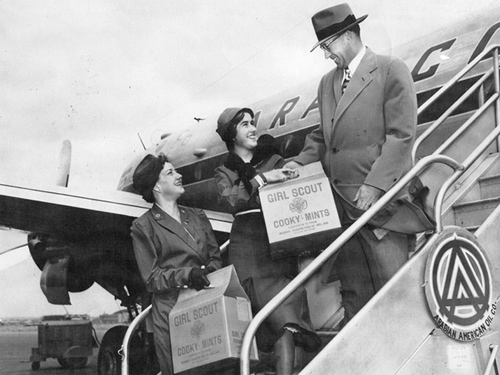 In 1950, the Girl Scout Cookie sale came to Saudi Arabia for the first time. In the photograph below, fourteen-year old Mariner, Louise Snyder of Stamford, Connecticut, gives cartons of cookies to her father, L.M. Snyder, Vice-President of Arabian American Oil Company, to deliver to the Girl Scouts in Dhahran, Saudi Arabia, 9000 miles away. Mrs. D.S. Fink, co-leader of the Girl Mariners Troop 25 of Stamford looks on. Mr. Snyder is shown boarding the "Camel", Aramco's plane at Idlewild Airport in New York. 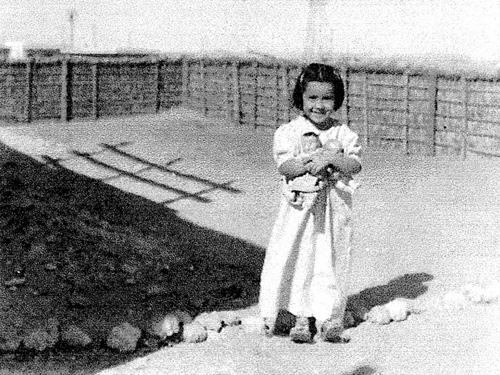 Arriving in 1940, Louise Snyder was one of the first American children in Dhahran. Here she is with her dolls in her backyard. Louise, her brother Miles and her mother Dorothy had to leave Arabia after the Italian bombing of Dhahran and World War II. They returned in 1945. 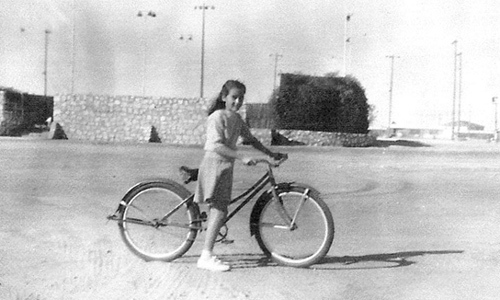 Here is Louise on her bike in 1947. In the background is the outdoor theater/tennis courts and behind them the light poles of the King's Road ballpark. Thanks to Tim Barger for providing the story and photographs!